Uses: Classroom Partitions Colors: Blue Lengths: 13 panel 24'-1" Heights: 6'-0"
Each year Eileen, an elementary education teacher, spends the week before Veterans’ Day teaching her students about the sacrifice, service, and selflessness it takes to serve our country and discusses ways we can honor those that have fought for our freedom. On November 14th, Eileen invites Veterans into her classroom to share their stories and to be celebrated. 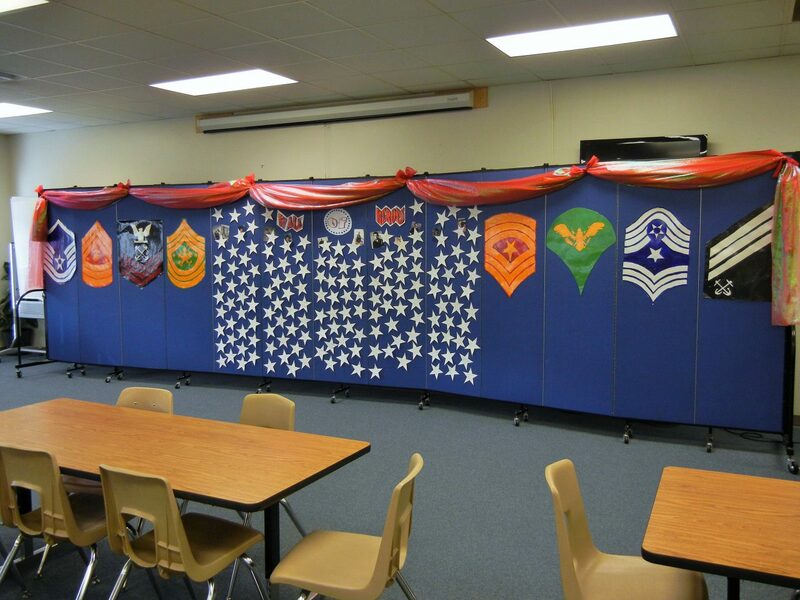 A tackable rolling partition is decorated to serve as an honor wall for the students’ special guests. Classroom tables and chairs are gathered to one side of the room and hidden behind the movable wall. The partition creates a backdrop for students to stand in front of to perform songs, poems, and readings for their special guests. “What I like about the tackable wall is that we can add decorations to the wall throughout the week and roll it to the side of the classroom until our celebration,” remarks Eileen.